As more and more properties offer breakfast to get their guests day off to a great start, the importance of breakfast attendants cannot be overlooked. These employees provide food, beverages, and a warm welcome to guests at your property. 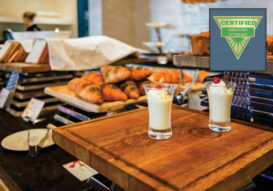 The Certified Breakfast Attendant designation recognizes that they have the skills and knowledge to provide excellent food and beverage service every morning at a lodging property. Candidates should complete the START for Breakfast Attendant training to prepare for the certification exam. The training is available in an online package with certification exam for individuals, or in print for group training. START for Breakfast Attendant is intended for employees/trainees in a classroom setting. It does not require an on-the-job training component. quickSTART for Breakfast Attendant is intended for on-the-job employee training or for trainees with access to a hands-on learning lab or internship where there are opportunities to perform job tasks. Those who complete the START or quickSTART program for Breakfast Attendant are prepared to take the Breakfast Attendant certification exam. The certification exam consists of 30 multiple-choice questions.